The China-Canada Tourism Year 2018 was launched on Wednesday in the Canadian city of Toronto with the objective of strengthening cooperation between China and Canada to bring in more tourism flow and investment. The event launch was marked by an official ceremony at Toronto's Four Seasons Center for the Performing Arts and attended by high-level officials and hundreds of representatives from the tourism industry in both countries. Canadian Minister of Small Business and Tourism Bardish Chagger said at the ceremony that the tourism year will not only promote the industry, but also boost mutual understanding and ties between the two countries. Chinese Ambassador to Canada Lu Shaye told Xinhua that the tourism year marks a milestone in the relationship between China and Canada. Canadian Ambassador to China John McCallum said the hosting of the Tourism Year program will open a new chapter of bilateral tourism exchanges and cooperation and help advance bilateral relations. 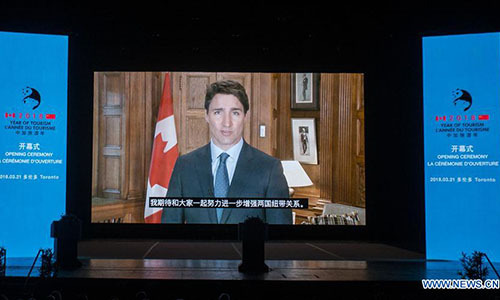 Since China and Canada established diplomatic relations in 1970, political, economic, trade and people-to-people ties between the two countries have deepened, yielding results that benefit both Chinese and Canadian people in a variety of fields. Canada has set itself a goal of doubling the number of Chinese tourists visiting the country by 2021. It recently opened seven new visa application centers in China to facilitate trips by Chinese visitors.